Our 4×4 division is staffed by fully qualified technicians who own four wheel drives and regularly take them off the beaten track. They understand the importance of correct servicing and preparation so that your four wheel drive will take you wherever you want to go and get you back home in one piece. What’s more our four wheel drive specialists are not only qualified light vehicle mechanics, but also fully qualified light diesel technicians and auto electricians. Is your vehicle under a new vehicle warranty? No problem, we will follow the service schedule to the letter using genuine parts, stamp your service book, save you money and not affect your new vehicle warranty. If your vehicle is higher in kilometres you may no longer be relying on your service book, in which case our in house servicing routine will keep your 4WD safe and reliable. All diesel upgrades are custom tuned on our in-house hub dyno. Expect power and torque gains of between 25% – 30% depending on the condition of your engine and associated components. Prior to commencement of any performance upgrade our tuner will chat with you regarding what goals you are looking to achieve. You may be considering modifications to the intake, turbo or exhaust system and these should always be completed prior to your performance upgrade, we are happy to recommend the appropriate products and install them for you. Our preferred method for performance upgrade is custom tuning as this ensures the tune is perfect for the characteristics of your particular engine. Suspension lifts, shock absorbers, diff lockers, heavy duty clutch upgrade, turbo upgrade. Talk to us about what you have in mind, we’ll offer sound advice on the best fit for your vehicle application. We have the special equipment and the expertise to ensure your mechanical repairs are attended to in a precise and timely manner. Engine reconditioning, differential overhauls, clutch replacement, gearbox and transfer case rebuilds – we attend to all of these repairs in house. Navara timing chain replacement with a double row chain conversion is a popular repair we perform regularly. To get the maximum life out of your expensive tyres you need to be sure your wheel alignment is set correctly. A simple check and toe in adjustment that is all too common place these days will see you shopping for new tyres again way too soon. Camber and Caster settings need to be checked and corrected when needed, particularly if the vehicle ride height has been altered. If your vehicle requires shim corrections to bring these settings back to specification that can be time consuming and as such is often avoided by wheel aligners. 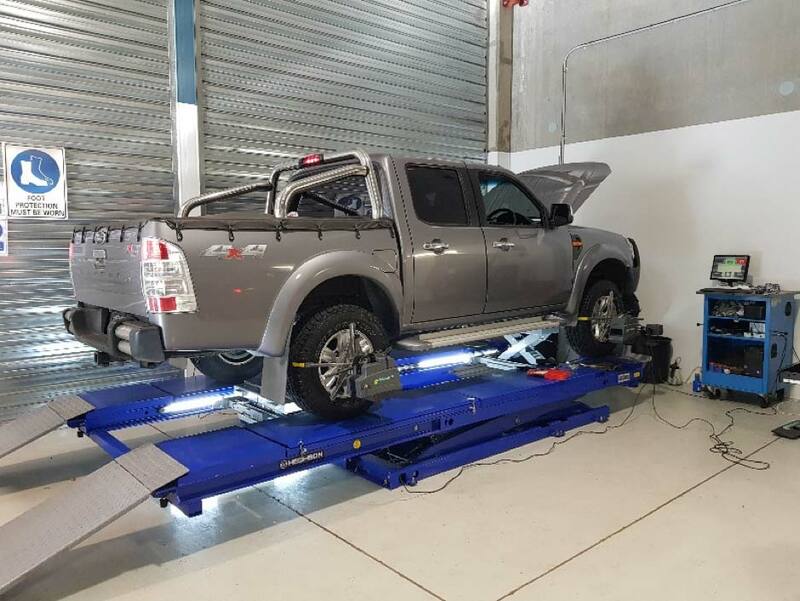 For this very reason we perform our own wheel alignments on site to ensure your four wheel drive wheel alignment is perfect. A wheel alignment underway including shim corrections. Note the rear axle geometry is also being checked as worn components in the rear will have a large influence in the steering of the vehicle and must be rectified.